Al-Haq was established in 1979 by a group of Palestinian lawyers following extended debate over how best to address the lack of human rights protection mechanisms in the Occupied Palestinian Territories (OPT). Founded as Law in the Service of Man, Al-Haq was one of the first human rights organisations established in the Arab world. During its first years Al-Haq remained small, hiring only a few staff members in addition to its founding members. Al-Haq's focus during these first years was largely limited in scope to analysing the legal status of and legal structures imposed over the OPT. Al-Haq produced some of the first studies ever written using humanitarian law to analyse a situation of occupation. Al-Haq's early studies on topics such as administrative detention and Israel's usage of the British Defence Emergency Regulations were seminal in shaping debate on what is applicable law in the OPT. Al-Haq's legal unit also developed during this period, working together with the research department to develop Al-Haq's positions and legal arguments. By 1986 Al-Haq had developed to a point where it was ready to expand. It was in this year that the organisation began taking on special projects on issues such as women's and labour rights. During this time Al-Haq's work and contributions in the field of human rights began to gain international recognition. In 1987, Al-Haq again began expanding its staff to meet the challenge of addressing violations arising from Israeli reaction to the intifada. Al-Haq started its fieldwork department in 1983 and the information gathered by Al-Haq's fieldworkers was at the heart of its work, but it wasn't until the intifada and resultant demands for information that the fieldwork department grew to include staff all across the OPT. During the intifada, Al-Haq developed into the primary source of information on human rights and humanitarian law violations in the OPT. Al-Haq's database remains the only systematised and carefully categorised catalogue of human rights violations that have been committed in the OPT. The first intifada was a peak period for Al-Haq. A number of important Al-Haq campaigns were started during this time and Al-Haq continued to grow, expanding into Gaza. It was during this period that Al-Haq was awarded the Carter-Menil Human Rights Prize. By the early 1990s Al-Haq had approximately 40 members on staff. 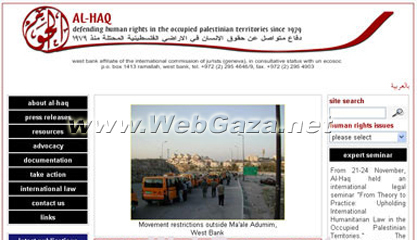 Al-Haq's size and its increased capacity helped it to successfully raise awareness of human rights abuses in the OPT and gained Al-Haq international recognition. At the same time, the unrestrained growth of the organisation was not matched by developments in the organisation's administrative structure, at times causing a lack of cohesion between Al-Haq's departments. The signing of the Oslo Accords in 1993 ushered in a new period in Palestinian history and greatly affected Al-Haq. The changes in the political situation required that Al-Haq reassess its mission. An outside facilitator was thus brought in and the organisation began a careful process of self-evaluation and strategic planning. During the strategic planning process it became clear that two camps were emerging in the organisation on the issue of how to address the Palestinian National Authority (PNA). Despite this disagreement Al-Haq began to move forward in work with the PNA, monitoring the Palestinian Legislative Council (PLC) elections in 1996, analysing legislation, and providing human rights training to PNA officials while at the same time monitoring PNA's human rights performance. The outside facilitator's evaluation of Al-Haq warned that latent disagreement in relation to political changes and how to deal with the situation as it changed if not addressed could lead the organisation to collapse. His warnings were taken seriously, and Al-Haq began to reduce its size by closing its office in Gaza and by shedding projects in areas in which other organisations were working. However, some disputes were never resolved and came to a head during late 1996 and early 1997. Al-Haq's Board eventually intervened and terminated all staff contracts leaving the future of the organisation in doubt. In 1998, Al-Haq began to rebuild. The Al-Haq Board of Trustees hired a new staff and took over many of the organisation's administrative responsibilities. The organisation's focus was also changed, with the Board taking the decision that Al-Haq should focus most of its attention on legal research and little attention on documentation activities. Work following up on draft PLC legislation and Israeli human rights violations moved forward. By 1999, individuals both inside and outside of Palestine were again coming to regard Al-Haq as a credible source of information on human rights violations in the OPT. Towards the end of 1999 Al-Haq was granted special consultative status with the Economic and Social Council of the United Nations (ECOSOC) and again began working on an international level. Moving into 2000 Al-Haq began to rebuild its fieldwork and database units. Financially stable and with its departments rebuilt, by the time the current intifada started in September 2000, Al-Haq was prepared to face the challenges that accompanied it. Between 2001 and 2002, Al-Haq began working to solidify and consolidate its structure and the Board, pleased with Al-Haq's work, returned to being a policy rather than an administrative Board. During 2002 renewed emphasis was also placed on returning to those activities that were Al-Haq's traditional strengths such as legal research and documentation. Al-Haq's consultative status with ECOSOC was also activated, through preparing oral and written interventions, and parallel reports as well as attendance at meetings and conferences related to human rights organised by the UN. 2002 was also the year of "Operation Defensive Shield," during which Al-Haq's office in Ramallah was taken over by Israeli soldiers and one of its employees, Yaser al-Disi, was arrested and kept in administrative detention for three months, without charge or trial. As part of its work with the PLC, Al-Haq carried out its first conference entitled "Towards a Palestinian Strategy for Legislation" in April 2003 to evaluate the legislative process and put forward recommendations for the improvement of the work in the future and for a more independent and efficient functioning of the Palestinian judiciary. In addition to this, Al-Haq lawyers and legal researchers prepared memorandums suggesting amendments to draft legislation, and contributed to the civil society organisational efforts to lobby for Palestinian legislation which incorporate human rights standards. The Research Unit was also involved with the Legal Unit of Al-Haq in the training of law enforcement officials, as well as civil society groups, in human rights and humanitarian law. In 2004, a year particularly focused on advocacy, Al-Haq launched an international campaign on collective punishment, considered both as human rights violations and as war crimes.